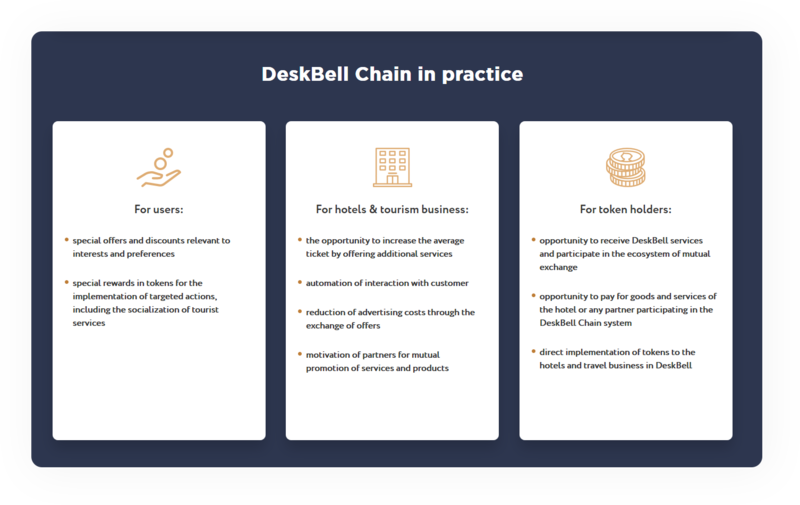 DeskBell — is a project of the blockchain platform in the field of tourism. On the one hand, the project is based on the existing service for the DeskBell hotels and, on the other hand, on the Ethereum blockchain technologies. 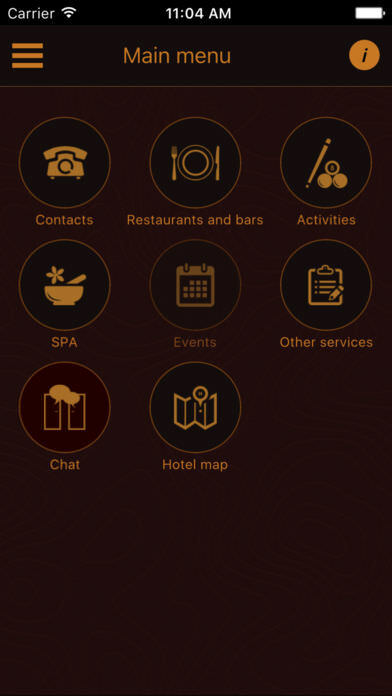 Mobile service DeskBell for tourists and hotel business is presented mainly in regions and has been tested in the local hotels. 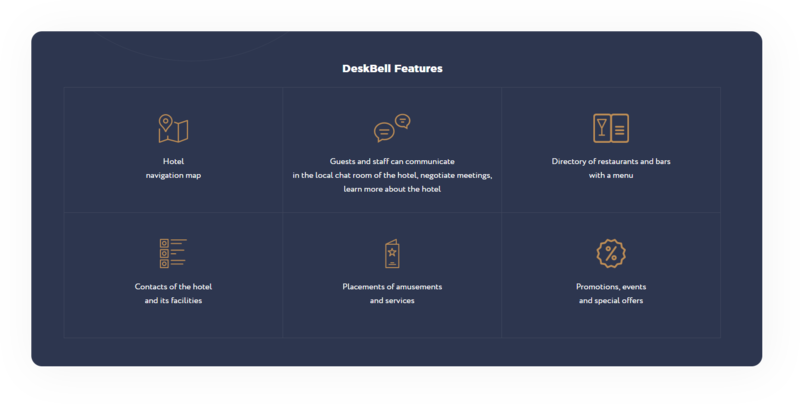 DeskBell has been a completely free service accessible to every user and hotel in the world. However, it is necessary to meet the challenges of the further development and monetization of the service. To develop a modern and legally stable system for users through a detailed study of the legal component of the project. 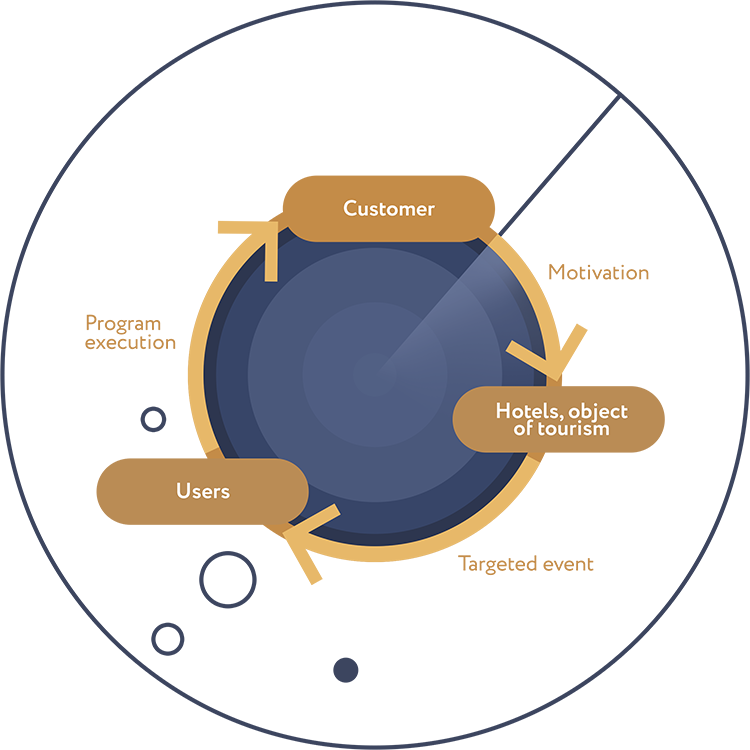 DeskBell Chain creates an ecosystem of mutual motivation, building chains of exchange services, compensation and rewards among hotels, travel businesses and their customers, end-users. The ways of interaction can vary. The key task of the project is to create a platform for implementing flexible marketing programs, from active and motivated participation of the clients in events distributed in the partner network, to the socialization of services and user content. We live in the era of localization of services. The market has more and more targeted solutions that can help you wherever you are. Our project successfully combines all aspects of these approaches, where blockchain technology is a huge support in terms of motivation and user convenience. It's time for global cross- integrations for applications and distributed registries - and we're building it today. Pre-ICO begins on March 26, 2018. More than 20 years of experience in the areas of management organization, risk optimization and strategic planning. He held a number of leading positions in various companies. Programmer with 9 years of experience, co-author of mobile communication service "Interda", 5 years of experience in the development of mobile applications. Project manager, leading programmer and inspirer of DeskBell. Developer with 15 years of experience in the Internet sphere, databases, co-author of the mobile communication service "Interda". He is responsible for the server part and API, co-author of the DeskBell Token project. Started working in the digital sphere in 2006. More than 11 years of experience in the development and management of projects. Founder of Fedorovlab Digital Agency. Among the clients are BigPicture, Stanislav Orekhov Studio, Paul Smith Russia and others. Marketing expert with 9 years of experience in various fields starting from industrial production to IT, has a diploma of advertising specialist and an MBA. More than 5 years of experince in software implementation projects, experience in supporting IT infrastructures in production and financial spheres. More than 3 years of experience in the mass - media. The author of the scientific work in journalism. Promotion of the service in California. Collaboration with celebrity actors, executive producer of the show "Whisper". More than 40 years of experience in media industry. Please, follow the link in order to learn more about our bounty program. What platform of this token? It's an Ethereum based. ERC20. ICO & Digital Due Diligence. Shadow expertising. Investment. How the customers can profit using DeskBell? In 2014 we came up with the idea to launch the project. 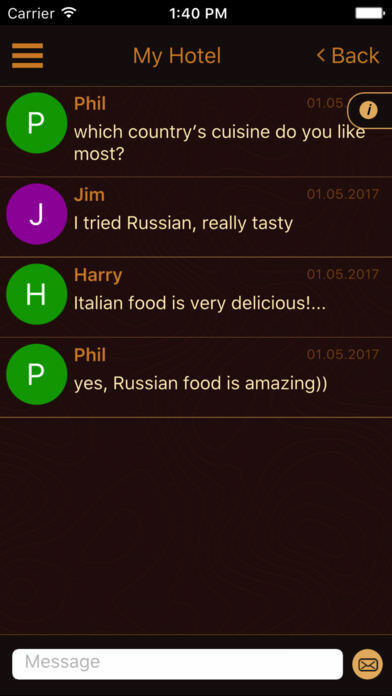 In Q4 2015 we created an application for IOS and Android (the link is up top of the page). 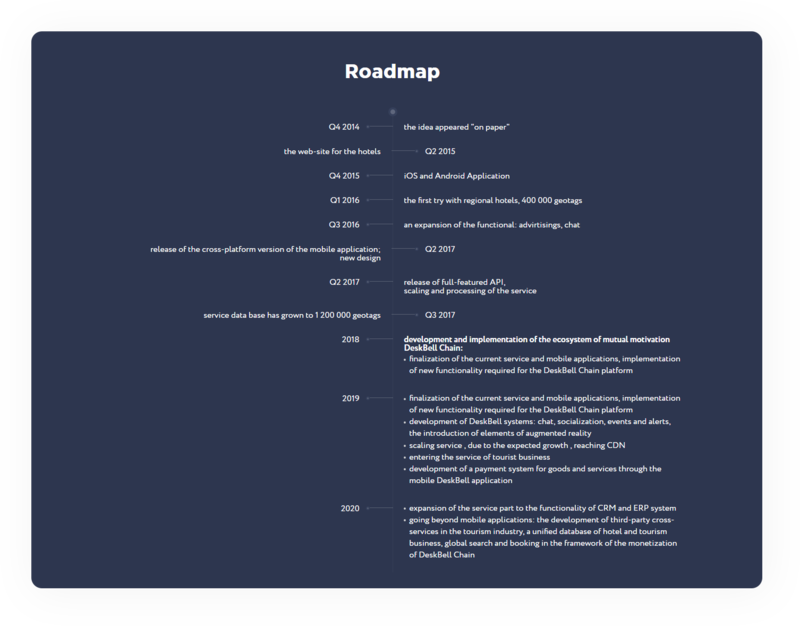 Also, please, read the Whitepaper and check the Roadmap of the project. Everything is described in there in details. Thank you very much for your fast response. I appreciate it! The DeskBell Chain project may be cited as a great example of introducing the technology into the industry in the 21st century. 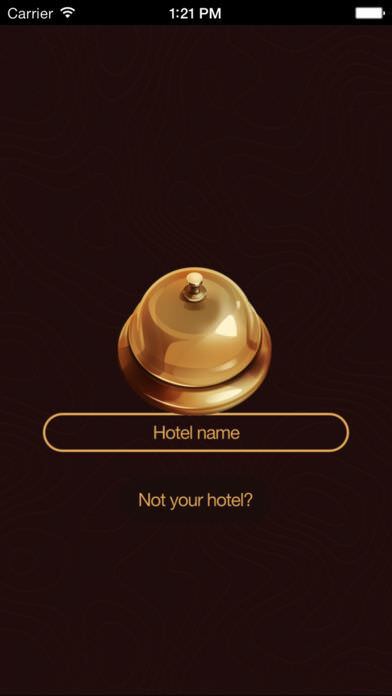 DeskBell is a blockchain-based project for serving the hotel business. Its main goal is to create a special model of interaction among a business and its clients in the sphere of tourism. The project will unite not only hotels and their guests but also the nearest institutions and local businesses into a unified ecosystem of mutual motivation. This will enable all participants to distribute and exchange services, offers and events. In this case, the motivating reward will be the DBT tokens. It is cool that you have an operating application. What countries/ cities are you going to start with? 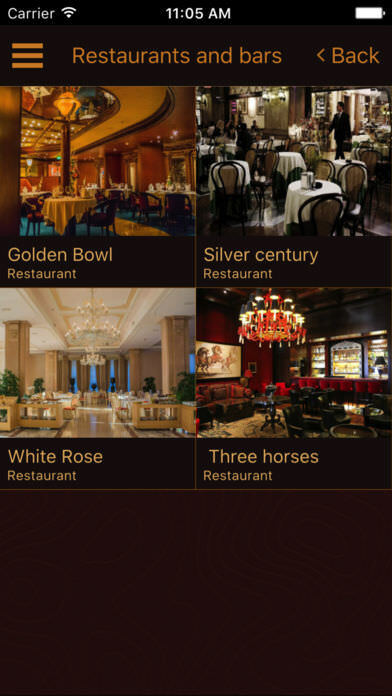 Thank you for the useful information, this project is really a great potential in the crypto world specifically to the tourism and hotel industry. Both businesses and token holders have many advantages and benefits that is very realistic and transparent. Hopefully am not yet too late to join the bounty and able to share the goodness about the project. It is a very promising project that has a nice, fully operating product! Wow nice to hear, thank you mate for the confirmation. We should support and disseminate what we feel, enjoy and understand about the project so that we can also help not only the project itself but also the bounty miners as well. Hi guys! DeskBell Chain seems interesting and promising! We apologize for the faults in the work of our website and personal account https://deskbell.io during the period from 9:55 to 11:10 GMT, we did not expect such loads on our resources on the day of the start of pre-ICO and took all necessary measures to ensure the stability of our servers. At the moment all resources of DeskBell Chain work in a regular mode. The pre - ICO stage of DeskBell Chain will begin in less than two hours. 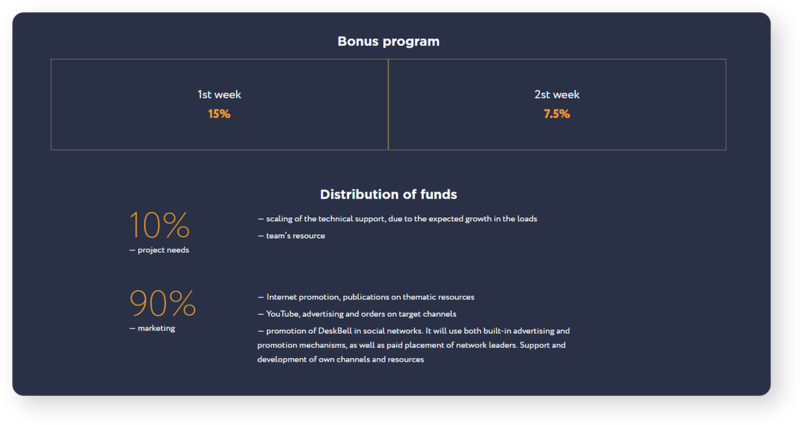 Please, visit www.deskbell.io , become the first investors and get 15% DBT tokens for free! what is the total amount of tokens? Hard cap, soft cap?